The Maasai, who roam the Maasai Steppe in and near the Northern Safari Circuit, are the most popular tribe to visit. Traditionally, Maasai live entirely off of animals, tending goats and cattle. Their main diet is milk mixed with cattle blood (by nicking the juglar vein, they cause no harm to the animal) They roam with their herds to wherever the best grazing land is at the present time. Although known as fierce warriors, they are very friendly people who welcome visitors. 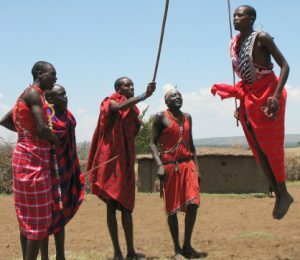 During a visit, you will get the opportunity to go inside one of their dwellings, participate in their song and dance,see their legendary jumping abilities, and learn about their traditional culture.